The Curious Wavefunction: What lessons did you learn from your graduate school advisor? 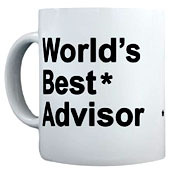 What lessons did you learn from your graduate school advisor? For better or worse, very few professional relationships in your working scientific life have as much of an impact on your career and your thinking as those with your graduate school advisor. You learn a lot from him or her, and sometimes if things unfortunately don't go well (as in the case of the recent much discussed fiasco), you learn what not to do. Your graduate school advisor imparts little tidbits of wisdom every single day. And yet there are a chosen few general lessons which stay with you long after you leave. These are lessons which you may not have imbibed consciously, and yet you find them being an integral core of your everyday scientific thinking. There is no big secret in these lessons, yet the process of internalization has greatly amplified their impact on a personal level. I was lucky to have been educated by two first-rate scientists who were (and are) also great human beings. I learnt a lot from them, but a handful of lessons have stayed put. This is of course a listing of key scientific lessons. Let's not even get started on other kinds of lessons which would fill an entire notebook. 1. Always question the assumptions: This was the single-most important lesson I learnt in graduate school and one that was driven home both subconsciously as well as vociferously. Because if the assumptions are flawed or questionable, then no matter how beautiful or even meticulous the study, ultimately it may be fundamentally wrong. How many times have you come across a piece of work which looks both exhaustive and elegant, and yet you don't buy it simply because you cannot accept the basic premise? Questioning the assumptions can keep you from being swayed by pretty papers in prestigious journals and turn you into the critical thinker that you crave to be. More importantly, this habit will be a perpetual guide that will help you realistically assess the conclusions of every project that you work on. Ultimately you have to remember that there is always an assumption behind every piece of scientific analysis, and assumptions are like enemies bearing gifts who want to become friends. You want to be suspicious of them until convinced beyond a shade of doubt. 2. Keep in touch with the basics: I mentioned this point in my last post, but it's worth reiterating. I used to be impressed by how my advisors would bring a point from college chemistry to bear on the analysis of a seemingly complicated synthetic scheme, reaction mechanism or NMR spectrum. Discussions of complicated problems often used to revolve around basic ideas of nucleophilicity and basicity (remember the differences in trends?! ), hydrogen bonding, ring conformations and oxidation states. Chemical problems often look complex because simple principles like to dress themselves up in fancy forms. These principles reveal themselves only when interrogated by equally simple questions. The great mathematician Paul Erdos once said that a tough problem proves its worth by fighting back. But on the flip side, it can also give way sometimes when subjected to the simplest of inquisitions. 3. Think multifactorially: Most problems in chemistry, no matter what discipline they are from, involve dissecting the myriad factors operating in a system and then putting your finger on the one that tips the balance. Integral to such an analysis is to first list the factors. A useful technique I try to practice is to list all the factors responsible for a particular chemical effect. For instance, if I were analyzing the binding of a ligand to a protein, I list all the possible hydrogen bonds, stacked aromatic interactions, hydrophobic contacts and other kinds of forces that could possibly operate between the different parts of the molecule and the protein. If it were to try to predict the stereochemistry of a reaction, I would think of dominant conformations, steric factors in the reagent and substrate, electrostatic interactions between the two. More sophisticated analysis can then follow, but this simple action puts things in perspective and sets you up favorably for getting a feel for the system. These lessons are certainly not panaceas and it takes a lot of practice and experience for them to become second nature (although ideally they eventually should). As time goes by you also find yourself adding your own functionality to them. But I will be grateful to my graduate school advisors for imparting them. And not through mere words, but through purposeful action. What scientific lessons did you learn in graduate school? Your first point, question assumptions, is right on. But I also learned to question facts. Just b/c it's printed in a journal, regardless of its prestige, doesn't mean every piece of data is real and accurate. Always pee before you teach. Everything you learned plus one more: "A conclusion is the point at which your mind stops thinking." Great points, especially the one about conclusions. Keep thinking. 1. Balance is key. To my boss, a full prof in a Top 20, nothing was more important than family, so he made sure to make time for them and was always understanding about travel for family emergencies or Xmas. He was also generous about travel to conferences; he remembered being young and broke. 2. I'll re-echo Wavefunction's statement about "the basics" - most of our data were simple measurements of different NMR properties which actually told us a ton about geometry and ligation. 3. The ability to take stock of where you are and reevaluate the project. If it's not going after prolonged effort, try something new. Conversely, if something cool crops up, you had the freedom to pursue that, too...my whole degree came out of a "side project" that kept rolling along.